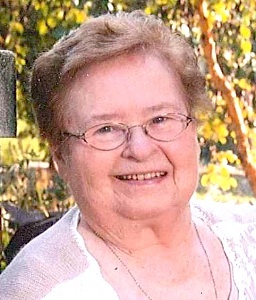 Lenora Lee (Foster) Smith, age 82, passed away peacefully on June, 21, 2015 at St. Luke’s Hospice House. In lieu of flowers, memorials are suggested to the Olathe Medical Center Charitable Foundation, 20333 W. 151st St., Ste 301, Olathe, KS 66061 (to benefit Hospice House of Olathe Medical Center), or to St. Luke’s Hospice House, in care of Saint Luke’s Foundation, 4225 Baltimore Avenue, Kansas City, MO 64111. Lenora (also affectionately known as Norie and Pearlie) was born December 6, 1932 in Olathe, KS to Edwin and Elizabeth Hayes. She was a graduate of Olathe High School, the Bethany School of Nursing, and the College of Saint Francis. During her nursing career, she was employed with the Olathe Community Hospital and Shawnee Mission Medical Center, retiring in 1994. She also enjoyed her work as a hospice nurse and chaplain, compassionately assisting those in their time of need. She was a comforting and supportive presence to those she cared for. To know her was to love her. She was a member of St. Aidan’s Episcopal Church and St. Michael and All Angels Episcopal Church where she was also a member of Daughters of the King. Most recently, Lenora was a resident of Overland Park Place, where she enjoyed participating in the Shining Stars Choir and served as an Ambassador. Surviving are her children, Dave Foster (Miles Krivena) and Anne Foster (Webb Siemens). She was preceded in death by her parents, an infant sister, and her husbands Robert Foster and Harry Smith.